Put On Your Fancy Hats! It’s Women’s Fiction Writers 1-Year Blogiversary Mega Book Giveaway! About a year ago I wrote a little post about women’s fiction and launched this blog. I wanted to read about women’s fiction and connect with other women’s fiction writers and authors. Who knew WFW would take on a life of its own? Who knew I’d start referring to it by initials? Not me! Many of the published authors who keep this site going with their insightful, funny, honest, heartfelt interviews have become my friends. Many of the aspiring (which keeps autocorrecting to aspirating, so please tell me if you prefer that and I’ll change it back) authors have become my friends as well. When you all chime in, email me, banter with me on FB and Twitter — I remember why I do all of this. To connect with like-minded writers. I must admit, it often leaves me a little verklempt. It’s all been worth the late-night WordPress frenzies, the lost emails, the mixed up calendars. (And I do love all the Amys who are now my friends!) I enjoy every bit of the behind-the-scenes of this blog. I like nothing more than interviewing authors — and I hope that passion shows. I was a Journalism major in college (when people still read newspapers). So go figure — I’m using my degree! In honor of writers, readers, old friends, new friends and friends yet-to-be, I’m hosting this mega-giveaway. Incredibly generous authors and friends-of-authors have DONATED a book (or quite a few books) or certificates or something else equally wonderful. The books are varied, not all are women’s fiction — and that gibes with that advice we’re always given about reading widely! Keep in mind that authors don’t get a lot of free books (sad but true). Some of these authors purchased their own books to donate. Others chose to use some of their private stash — each of their names is linked below so you can learn more about them. Of course, I’ve thrown in a doodad or two as well (doodad = book). These people are your supporters — so when you get a chance, check out their websites. Give their books a go. They’ve come together on our collective behalf to celebrate what we have in common — writing. More specifically, writing under that broad umbrella of women’s fiction. ANYONE in the USA or Canada over the age of 18. If you are outside the USA or Canada and can/are willing to receive an e-prize, you’re welcome to enter, just note you’ll need to be able to download and/or use ebooks/e-giftcards etc. Just leave a comment — one comment — say hi or tell me your favorite book or which fancy-hat lady you like best — or “like” my FB author page and tell me you like me! Or just say you want to be entered. I’m easy (but that’s another post). Leave your email address WITHIN the comment please, so I don’t have to track you down to give you a prize! ONE ENTRY per person please — but if you spread the word about the giveaway I’ll be grateful and you’ll get like gazillion niceness points. MONDAY, APRIL 2. COMMENTS WILL REMAIN OPEN, AND ENTRIES ACCEPTED, UNTIL 11:59PM CENTRAL TIME, SUNDAY, APRIL 1. Many. When I’ve finished counting all the books and gifts and know how many entries there are, I’ll decide. I want to give away as much to as many as possible! Winners will be randomly chosen. Perhaps by my dogs. Maybe by my daughter. They vie for my attention so it could be interesting. Books/Prizes will also be chosen for each winner randomly. If you don’t live in the USA you can’t win a book but you can win a gift card or an e-something, so keep that in mind, please. Thank you all for your support of this blog and of me. Here’s to Year #2 for Women’s Fiction Writers! NOW GO ENTER THE GIVEAWAY!! Oh my goodness… what a potpourri of giveaway goodness! Yummy! I have so enjoyed your blog, Amy, and can’t believe it’s been a year already. Super congrats and what a grand idea to have a super giveaway! So many incredible authors on your list that it’s impossible to pick favorites. I will say,however, that I have very much enjoyed the work of Erika Marks, Randy Susan Meyers, Therese Walsh, Camille Noe Pagan, and Eleanor Brown over the past year… Liz Michalski is also waiting in my TBR stack. And then I really look forward to reading the work of Amy Hatvany, Kimberly Brock, Erika Robuck, Ann Weisgarber — oh heck… ALL of them (if only there were more hours in a day for pure reading). Thanks for introducing us to so many wonderful authors and for providing this wonderful insight. melissa(at)azcommpro(dot com). It’s a great blog, Amy, and you’ve done wonderful things with it. Happy Anniversary! Happy Anniversary, Amy! I do enjoy your blog and yes, your enthusiasm shows! Happy Anniversary, Amy! What a wonderful blog, you should be very proud! Happy anniversary! Long live women’s fiction! Can I just say that your blog was, and is, an absolutely outstanding one? How wonderful it is that you’ve managed to bring so much thought to the craft of writing women’s fiction! I love hearing from so many different women about the way they weave their stories. And, yeah, I’d love to enter your giveaway, too! Thanks for your hard work. My email is hollyrob1@gmail.com. Congrats on your blog anniversary.. This is the first time I am stopping by.. a friend recommended you… I love your hosting a giveaway.. always fun… My favorite book was and is the Red Tent. Amy, I was thrilled months ago when I discovered your blog. I may not comment often, but I read every single post. Your blog has caused my to-be-read list to become unmanageable. I’m finding lots of lovely, varied authors of women’s fiction here and I want you all to succeed! Looking forward to reading another year of WFW posts. The lady in the center of photo with big white bow and skinny black hat is my favorite because she is rocking that hat: the angle is just right. HUGE CONGRATULATIONS!!! How exciting!! I have absolutely loved connecting w/ new books and writers on your blog — and I’ve gotten terrific insight on many things, and I’ve also been quite inspired! So thank you so much! Gotta ask – what does autocorrect do with verklempt? Happy Blogiversary, Amy! I’m so glad I found your blog. It really is a great read. Cheers to you and many more posts! Congratulations on your anniversary! Since I’m still trying to fit if my style of writing fits romance or WF (or something in-between ), I’m so glad I discovered this blog. Happy Anniversary, Amy! Congrats on a year that has been successful in so many ways! I am in awe of your blogospheric mastery. Where do you find all that time and inspiration? Congratulations on your anniversary! Susan Schoenberger recommended visiting your blog, so here I am! The best book I read recently is “The Dovekeepers” by Alice Hoffman. I couldn’t put it down, but it’s not for everyone–there’s lots of history woven throughout the story–but I thought it was brilliant. I just discovered your blog. What a find! Looking forward to catching up. Please enter my name in the giveaway. Yea. Happy blogiversary! I only recently discovered this blog, but since I’m all about women’s fiction, I’ve been obsessed with it. Thanks so much for putting your energy behind this! This sounds like quite an undertaking, but please draw my name. I have empty spaces in my kindle and on my bookshelf! Happy day to you! I’ve only somewhat recently found your blog but it’s great! I have way too many favorite books to list. But I’m sure you know I love women’s fiction and chicklit. It’s been a wonderful year, Amy, and you’ve shared so many new stories and writers with us–thank you! Here’s to another great year–and just think: the NEXT blogiversary will include YOUR novel, THE GLASS WIVES! What a fantastic list of authors for the giveaway!! Great authors and a great anniversary!!! Congrats! I’m usually just a lurker, but wanted to pop in and congratulate you on your one year anniversary. Awesome, Amy. Enjoy your day! Dear Amy, You are doing a wonderful job. I discovered this blog several months ago and look forward to every post. As someone else commented, my to-read list is growing unmanageable. It is so exciting to find new authors that I might have heard about or have never heard of. Your interviews are terrific. I sometimes write a little bit but thenI realize I like reading more. Keep up he good work and I will keep reading your posts. So happy for you that you made such progress over the last year and I love to read your blog posts and interviews and am grateful you have included me in this. It’s superb to be in the company of writers, no matter the genre. Go You! My favorite fancy hat is on the bottom row, second to the left. Why, you might ask? Because it is the biggest! Happy fancy hat Blogiversary, Amy!! I found your blog last summer and it has been so great to learn about new authors through your excellent interviews (the fact that you were a journalism major makes so much sense!) and read about their struggles and triumphs. Thank you! And, yes, please enter me in your giveaway. You’ve collected an amazing group of donation authors–I’d love to win something from any one of those ladies! Looking forward to your book, too! Amy, you’ve built such an amazing community here! I can’t believe it’s only been a year. Dang, has it really been a year? A whole year? You know how I feel about this blog and what you’ve done with it. Proud of you, lady. I’d like to be entered (that was easy). Liz told me about you. Congratulations, Amy!! I check your blog regularly, both for your insights as a new writer and for those super-duper interviews. YAY!!! Favorite hat: First row, second from the right. That girl has style! I am thoroughly enjoying this community. Happy bloggiversary! I would love to be a winner of a new book!! Do I have to say anything else to be entered? My email is emma@emmaburcart.com. My favorite books to date are “The Glass Wives” and “Herbie’s Star.” However, Brisket and the Art of Long-Term Friendship touches my heart greatly and makes me feel so honored. Happy bloggiversary — I just stumbled on it via Christi Craig. Love the photo, and your post made me laugh more than once. I feel like I already won something, smiling is a great prize! Hi Amy, relatively recent lurker and occasional commenter. Wish I’d found your blog a year ago! My email is downithm@yahoo.co.uk but I’d way rather win a real book – I am Canadian and still visit regularly so you can mail to my family who are still there, if I do happen to win. Love your blog and esp your definition of women’s fiction! Hi Amy! So nice to “meet” you! Tina Ann Forkner sent me the link to your blog and if the same sense of humor comes through in your writing, I definitely will have to read your writing! My e-mail is robinlhocking@gmail.com, if you feel so inclined to introduce me to more authors! Congratulations on your success – I’m quite certain you’ll experience much more! Such a great premise for a site and a wonderful giveaway. Happy Blogiversary! Where would we women be today without hats, blogs and women’s fiction! What a fantastic give-away and thank you for allowing us, the readers and sometimes hat-wearers, to be a part of this! Where would we women be without hats, blogs and women’s fiction? What a fantastic give-away. So many wonderful gifts. Thank you for allowing us, we readers and sometimes hat-wearers, to be a part of this. Let the fun begin! Hi Amy…Congratultions on your one year Anniversary! What a wonderful blog, good wishes for the coming year. I found your blog thanks to Christi Craig. This is a great resource and I look forward to reading more of what is written here; I’ve added you to my blog reader! And I love the picture of women with hats. 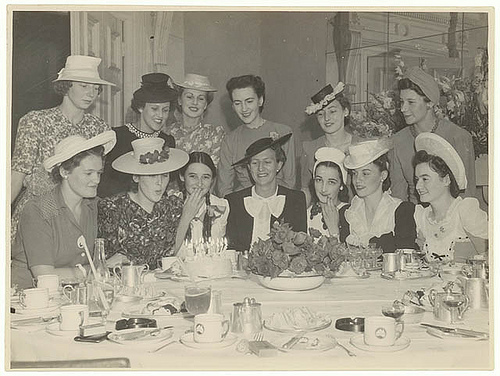 I have two favorites: the small black hat on the woman standing in the back row. The hat which I assume is intentionally made to appear small – is awkward and cute and looks as if it will topple at any moment. And I like the woman with the hat, standing on the far left. Her hat looks borrowed and often stuck in a closet somewhere and like she is not comfortable in the hat and wishing the photographer would just finish so she can get back to reading a book on the sofa. She’s someone’s sister or best friend and not particularly comfortable there but feels an obligation. Or maybe not. It’s fun to read stories from a picture of people I don’t know. Just found this blog & *Liked* your FB page. I write Women’s Fiction, and am planning to follow WFW regularly. Congratulations, Amy! Happy Blogiversary! You’ve achieved so much in a year. So well done! Looking forward to another year of WFW. Happy Anniversary Amy and I am very proud to have appeared on your site. I live in Italy so won’t be entering the competition but congrats to the lucky winners – I see you have some fabulous reading material on show. Best wishes for your book and see you next blog year! As a published author, I appreciate all the donations by these authors and wish them the best in their book promotions. I like the fancy-hat lady covering her mouth because she’s not wearing a hat. How embarrassing! Congratulations on your wonderful blog’s anniversary! I like the lady caught without her hat, a hand covering her mouth. How embarrassing! Congrats on your wonderful blog’s anniversary! Happy blogoversary! Love this blog and getting it in my email. One of my favorite authors that you have featured is Tina Ann Forkner. Bought her books and devoured them in one weekend. Congrats on the blog’s birthday! I hope you bake a cake (better yet, let someone else bake the cake) so that you can blow out the candle. My wish for you: your novel lands on the bestseller list! My favorite book is Charlotte’s Web. If ever there was a strong female character, it was Charlotte, the problem solver who understood the importance of word choice. Wow, merely a year has gone by. Look how far you’ve come! Congratulations! Big hug from this little central American country! I like the lady on the top in the middle. with no hat. Daring to be different. Like all those ladies, we are all very much the same as writers- different on the outsdie but full of the same wishes, desires and a bit of quite to hear the stories we are creating in our mind a little bit louder. Great blog and big congrats on the soon to be release novel. Happy blog-averisary! This is a great blog and I really enjoy it. Viva les femmes! LOL! And that is quite the impressive collection of books (and fans and supporters) you’ve collected for this event! Way to go! Congratulations on your blogoversary! Though I only recently discovered your blog and tend to lurk, I have been an avid reader since. Congratulations on your book and happy anniversary on the blog! I don’t get much time for reading these days, but would love to win a free book. I don’t have a favorite book, but do have favorite authors: the late, great Erma Bombeck, who always made me laugh; Janet Evanovich, who makes me laugh now, and Anne Rice, whose adult vampire and witch books created amazing fantastical cultures before the YA books like “Harry Potter” and “Twilight” became popular. And Rita Mae Brown’s “High Hearts” is one of my favorites as well. I read several of these authors already and would love to have more new stuff to read! Congrats on the success of your wonderful blog, Amy. (Raising mug of tea) Here’s to another fine year! Wow! Look at all these entries! Can’t wait to see who I’m sending some books too! Love your site, Amy. Thanks for being there for authors and writers. We love you. I hope someday, I’ll have a book of my own to give away. Congratulations! Happy blogoversary! I recently found this blog, and I’m SO glad I did. I’m having so much fun reading the blog and adding to my ever-growing TBR list. It’s wonderful to see so many women’s fiction lovers gathered in one place. Thank you for creating such a great resource!